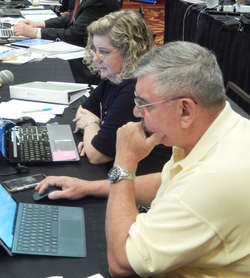 The ARRL Board of Directors has adopted the recommendations of the Official Observer Program Study Committee, which would retire the venerable Official Observer (OO) Program and institute the Volunteer Monitoring (VM) Program. The Board took the action at its July 20 - 21 meeting in Windsor, Connecticut, instructing that the transition "be implemented as soon as practicable." Under the terms of the new program, current Official Observers will be invited to apply for appointment as Volunteer Monitors. The Board expressed its appreciation for the OOs and their dedicated volunteer service over the years. The administrator would also "develop a rubric or other aid for program participants to highlight offenses and other criteria that the FCC considers a priority," the motion said. The administrator also would be charged with organizing periodic webinars, highlighting technologies, techniques, and other continuing education topics that would assist, motivate, and better enable Volunteer Monitors. The FCC will be actively involved in the development and presentation of these training opportunities. 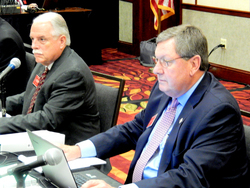 The action further authorized ARRL President Rick Roderick, K5UR, to terminate the standing Amended Agreement between ARRL and the FCC Field Bureau regarding the use of amateur volunteers and execute a new Memorandum of Understanding (MOU) between ARRL and the FCC Enforcement Bureau. The MOU is under final review. unanimously adopted recommendations of the ARRL Executive Committee to update ARRL's Articles of Association and Bylaws (see the July 2018 issue of QST, p. 74, or refer to Minutes 22 - 25 of the Board's July 20 - 21, 2018, meeting). received the preliminary final report of the PSEWG regarding the rollout of the ARES Connect program, which will be announced in the September issue of QST. The Board agreed to obtain additional field input this fall. accepted and discussed reports from standing committees as well as ad hoc and advisory committees of the Board. Read more. Producers and staff of The Takeaway -- a daily radio news magazine produced jointly by Public Radio International, WGBH, and WNYC, and produced at WNYC in New York -- were named to receive the 2017 Bill Leonard, W2SKE, Professional Media Award for Audio Reporting. The program, aired by more than 280 outlets, included an in-depth interview with ARRL Emergency Preparedness Manager Mike Corey, KI1U, about the role of Amateur Radio volunteers deployed in Puerto Rico following Hurricane Maria. The Weather Channel's Jim Cantore, Jen Carfagno, and TWC's AMHQ program staff were the joint recipients of the 2017 Bill Leonard, W2SKE, Professional Media Award for Video Reporting. AMHQ also conducted an extensive interview with Corey about Amateur Radio's role in Puerto Rico in the aftermath of Hurricane Maria. ABC affiliate WCIV-TV in Charleston, South Carolina, was recognized for "its outstanding coverage" of the August 2017 solar eclipse. The station aired a live remote broadcast with members of the Charleston Amateur Radio Society (CARS) regarding their on-the-air efforts to record the eclipse's propagation effects during the Solar Eclipse QSO Party. The station was credited with explaining "the application of physics, radio theory, and other sciences" and their importance and relevance "in a comprehensive, yet understandable manner." E. Gordon Mooneyhan, W4EGM, was named the winner of the 2018 Philip J. McGan Silver Antenna Award for his outstanding public relations success on behalf of Amateur Radio as an ARRL Public Information Officer in the South Carolina Section. Mooneyhan was credited with adapting and applying "innovative strategies to emerging social media" in promoting Amateur Radio and events. The Amateur Radio Emergency Data Network (AREDN) project team was named as recipient of the 2018 ARRL Microwave Development Award for its initiatives to utilize Amateur Radio's microwave bands. These included extending the network's high-speed multimedia capabilities from solely 2.4 GHz to 900 MHz, 3 GHz, and 5.8 GHz, and adding 802.11n protocol to improve data throughput. The Board also acknowledged the efforts of the many AREDN implementation groups around the country who are building networks based on this technology and who stand ready to utilize them to serve the needs of their communities in times of disaster. In addition, the ARRL Board of Directors conferred the title of ARRL Director Emeritus on Coy Day, N5OK, in recognition of "superior and distinguished service to the Board. Day served for 9 years as ARRL West Gulf Division Director and has continued to be active in supporting ARRL and its mission, including serving on the ARRL DX Advisory Committee." Read more. The FCC has issued a Citation and Order (Citation) to Amcrest Industries, LLC (formerly Foscam Digital Technologies, LLC), an importer and marketer of popular and inexpensive Baofeng handheld transceivers, alleging that the company violated FCC rules and the Communications Act by illegally marketing unauthorized RF devices. The FCC asserts that Amcrest marketed Baofeng model UV-5R-series FM handheld radios capable of transmitting on "restricted frequencies." The Baofeng models UV-5R and UV-5R V2+ were granted an FCC equipment authorization in 2012 to operate under Part 90 Private Land Mobile Radio Service (Land Mobile) rules. "Under § 2.803 of the Commission's rules, an entity may not market a device that is capable of operating outside the scope of its equipment authorization," the FCC Citation said. "RF devices that have been authorized under Part 90 rules, such as the model as issue, must operate within the technical parameters established in those rules." The FCC also maintained that the UV-5R 2+ is capable of operating at 1 W or 4 W, while the Part 90 Equipment Authorization limits the power output to 1.78 W.
Amcrest conceded that the units were capable of operating on restricted frequencies but told the FCC that, per discussions with the manufacturer, were "only capable of operating at 1 W, the FCC said. The company instructed the manufacturer to fix the problem and later confirmed with the manufacturer that all Amcrest inventory on order and in the future would operate only on 145 - 155 MHz and 400 - 520 MHz. Amcrest told the FCC that it had ceased marketing four models in the Baofeng UV-5R series "a few years ago," but it did not remove them from its website until last February. Numerous online retailers continue selling UV-5R series radios for less than $25, with some ads indicating that these are "ham" equipment. Read more. "Antenna Rotators" is the topic of the new (August 2) episode of the "ARRL The Doctor is In" podcast. Listen...and learn! Nineteen-year-old Ruth Willet, KM4LAO, of Cana, Virginia, was named the recipient of the 2018 ARRL Hiram Percy Maxim Memorial Award by the ARRL Board of Directors at its July 20 - 21 meeting. ARRL's top youth honor, the Hiram Percy Maxim Memorial Award is given annually by the Board to a radio amateur under the age of 21 whose accomplishments and contributions to both Amateur Radio and the local community are of an exemplary nature. 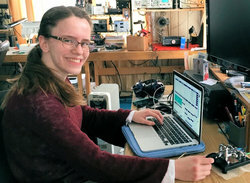 Willet, who earned her Technician-class license in June 2015 and upgraded to Amateur Extra in May 2016, was instrumental in re-establishing the Amateur Radio and Electronics Club (K8HPS) at Kettering University in Michigan, where she is a junior pursuing a double major in engineering physics and mechanical engineering while maintaining an A average. She alternates 11-week academic terms with 11-week co-op jobs at Textron Specialized Vehicles in Augusta, Georgia. Willet recently relocated to Virginia from Lawrenceville, Georgia, where she grew up. Willet is actively involved in recruiting and mentoring new licensees and in community awareness programs, including demonstrations during the August 21, 2017, total solar eclipse. She is on the air daily on HF, using SSB or CW and satellites. In addition to her membership in ARRL, Willet belongs to AMSAT and CWOps, as well as several other clubs. She enjoys HF contesting, participating in local club events, and chasing and roving to grids on Amateur Radio satellites. Willet and her mom Sharon, KM4TVU, participated in ARRL's highly successful National Parks on the Air (NPOTA) event in 2016. 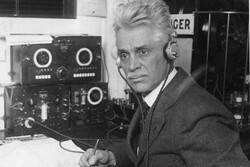 Award namesake and ARRL cofounder Hiram Percy Maxim, 1AW. Willet won the 2017 ARRL August QST Cover Plaque for her article "The 2016 Youth DX Adventure to the Caribbean Island of Saba," based on her experience as a participant. In May, Willet was presented with the Radio Club of America's Young Achiever Award. Last spring, she was the keynote speaker at the 32nd annual SWODXA DX Dinner, held in conjunction with Hamvention®, where her topic was "Experiencing the Hobby of a Lifetime." She also spoke at the 30th Hamvention Youth Forum in 2017 on "Plugging into Your Valuable Club Resources." The deadline to submit a design for the 2018 QST Antenna Design Competition is just ahead -- September 1. The competition challenge is to design the best LF, MF, or HF antenna for limited-space applications. ARRL can only accept one entry per person (or team), but there's not much time left to complete building and testing of your design. Full details appeared in the June 2018 issue of QST. Three cash prizes are on the line: First place is $600, second place is $250, and third place is $150. Even designs that don't win a prize may still be eligible for future QST publication. drawings with dimensions (hand drawings are okay), a list of materials, and photos. a description and summary of any measurements taken, including modeling and files (modeling is not a requirement). a discussion of observed on-the-air results and any comparisons with other antennas. the submitter's name, mailing address, and email address. 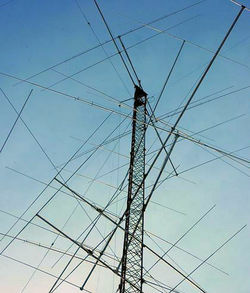 All antennas based on submitted designs must be the sole creations of the entrants and not available for sale. Winners will be chosen based ingenuity of design, mechanical and electrical safety, expected performance, and durability. The judges' decisions are final. Mail entries to QST, ATTN: Antenna Design Competition, 225 Main St., Newington, CT 06111 or email your entry, including call sign, with the subject line of "2018 Antenna Design Competition." If submitting more than 6 MB of material, use separate email messages. Do not send compressed ZIP files, as these will be rejected. The ARRL 2017 Annual Report, which highlights the organization's efforts and activities throughout 2017, is now available. Starting with the cover photo, Amateur Radio's response to the Atlantic hurricane season figures prominently in the report. Amateur Radio has repeatedly been the only means of communication into or out of an area affected by a natural disaster. 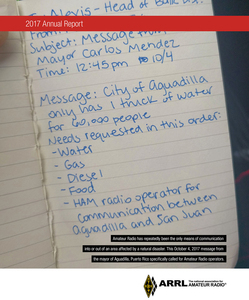 Puerto Rico was especially hard hit by Hurricane Maria, and the cover depicts an October 4 message from Mayor Carlos Mendez of Aguadilla, Puerto Rico, calling for an Amateur Radio operator to support communication between his town and the capital city of San Juan. In his message to ARRL members, President Rick Roderick, K5UR, suggested that a paradigm shift is under way within Amateur Radio. "The wants and needs of the new-generation hams are very different from those of 'traditional' hams -- of which I consider myself one," Roderick wrote. "[W]e've got to embrace and meet the challenges of new technological developments and the operating trends of the next generation. It's a different landscape than when I started. ARRL is there to support and promote these new things as outlined in our mission statement -- to advance the art, science, and enjoyment of Amateur Radio -- and to fight for our spectrum allocations, but the organization does not 'own' Amateur Radio. That ownership rests with hams." Roderick said seeds for change planted in 2017 are starting to sprout, as ARRL also adapts to a changing Amateur Radio environment. In his report, CEO Barry Shelley, N1VXY, looked back on what he called "a remarkable year" for ARRL -- one that first and foremost was defined by change. "Much of the change could be considered internal to the organization, and not always visible," Shelley wrote. "But the changes that occurred helped create new ways to face and deal with some of the challenges presented throughout the year," adding that one of the biggest challenges ARRL faced in 2017 -- and one of the most public -- was the response to the devastating hurricanes in the Caribbean and southeastern part of the United States." The Emergency Preparedness Department reported an upward trend in Amateur Radio Emergency Service® (ARES) activity. "An increase in reported activity was noted during the months of August through November, due to Amateur Radio response activity for hurricanes Harvey, Irma, and Maria; wildfires in the western US, and the total solar eclipse that occurred on August 21," the report recounted. The narrative tells how additional Ham Aid program equipment was on its way to Puerto Rico by September 9 in response to Hurricane Irma. After Hurricane Maria, more Ham Aid packages were dispatched to Puerto Rico with 22 Red Cross/ARRL volunteers. From the 2017 ARRL Annual Report: Craig McVeay, N0CSM, was one of the 22 ham radio operators who deployed to Puerto Rico. "I have friends in Puerto Rico," he said. "So it hit close to home. I wanted to go help very badly." "During the 2017 hurricane season, particularly after the damage hurricane Maria caused in Puerto Rico, ARRL experienced a significant increase in awareness of Amateur Radio and the service that ham radio operators can offer in times of emergency," the report noted. The ARRL VEC Department summary pointed out, "Interest in Amateur Radio took an upturn in the second half of the year, due to a heightened awareness of Amateur Radio's potential role during natural disasters." From a financial perspective, 2017 was a good year for ARRL. Overall revenues were up and expenses were down, resulting in ARRL producing a $1.4 million gain from operations. The Annual Report includes a comprehensive auditor's report and financial statements. The ARRL exhibit for the 2018 edition of the world-famous air show complemented other ham radio demonstrations. ARRL Marketing Manager Bob Inderbitzen, NQ1R, worked with a team of members who supported the exhibit at the weeklong aviation celebration and fly-in. The annual event typically draws more than 500,000 visitors, many of whom had signed the ARRL guest book. ARRL Life Member and flight instructor TJ Johnson, K9KJ, of Munster, Indiana, was among those stopping by the ARRL booth. He shared his experience of operating aeronautical mobile during ARRL Field Day with his friend Bob Johnson, W9XY. Two Amateur Radio Special Event Stations were on the air throughout AirVenture. Organized annually by the Fox Cities Amateur Radio Club in Appleton, Wisconsin, W9ZL was set up at KidVenture at the Pioneer Airport airstrip in Oshkosh. The EAA Warbirds of America AirVenture Celebration Special Event Station, W9W, was set up near a display of vintage military aircraft. 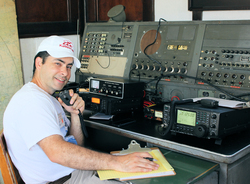 Booth volunteers helped to direct newcomers to radio clubs and to Amateur Radio test locations, Inderbitzen said. 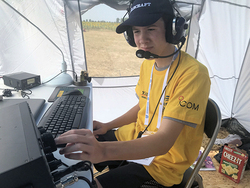 Fourteen-year-old ARRL member Bryant Rascoll, KG5HVO, of Montgomery, Alabama, has been selected as the 2018 Bill Pasternak, WA6ITF, Memorial Amateur Radio Newsline Young Ham of the Year (YHOTY). The son of Tim and Lauren, KG5TQO, Rascoll, Bryant was the youngest participant in the recent World Radiosport Team Championship 2018 (WRTC 2018) in Germany. Bryant says he became enthusiastic about Amateur Radio after joining the Boy Scouts and earning the Radio Merit Badge. Listening to a counselor's contact with a station in the Netherlands during an ARRL DX contest fueled his desire to become a radio amateur. First licensed as a Technician in 2015, he had upgraded to Amateur Extra class by late 2017. He credits his many mentors in the Jefferson Amateur Radio Club (W5GAD) during his time in Louisiana for exposing him to several aspects of Amateur Radio, including contesting, CW, Field Day, special event stations, public service events, hamfests, and conventions. He was the club's 2016 Member of the Year. At WRTC 2018, where he paired up with Mathias Acevedo Von Frey, CE2LR, of Chile, Bryant was the only youth competitor from North America. A recent issue of NCJ highlighted his accomplishments and identified him as one in the next generation of contesters. He is a member of the CW Operators' Club (CWOps) and an honorary member of the Georgia Contesting Group. Individually, he placed first in the Low-Power Rookie category in North America in the 2017 CQ WPX SSB contest and first place in the Louisiana Section in the Single-Operator, Low-Power Unlimited category in the ARRL 2017 International DX CW and SSB contests. Tad Cook,K7RA, Seattle, reports: After 6 days with no visible sunspots, a new one appeared on August 1, with a daily sunspot number of 11. With only one day with a sunspot in the previous week, the average daily sunspot number for this week remains unchanged at 1.6. Average daily solar flux was down from 68.4 to 68. The average daily planetary A index decreased from 8.1 to 5, while the average daily mid-latitude A index went from 8 to 5.1. 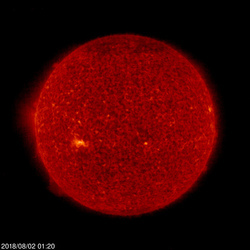 According to an August 1 US Air Force forecast, solar flux is expected to be 70 on August 2-9; 68 on August 10; 70 on August 11-17; 68 on August 18-20; 66 on August 21-23; 68 on August 24 - September 6; 70 on September 7-13, and 68 on September 14-15. Predicted planetary A index is 6 on August 2-3; 8 on August 4-5; 5 on August 6-11; 8 on August 12-13; 5 on August 14-15; 8 and 12 on August 16-17; 5 on August 18-19; 20 and 12 on August 20-21; 5 on August 22 - September 1; 10 and 8 on September 2-3; 5 on September 4-7; 8 on September 8-9; 5 on September 10-11; 8 and 12 on September 12-13, and 5 on September 14-15. Sunspot numbers for July 26 - August 1 were 0, 0, 0, 0, 0, 0, and 11, with a mean of 1.6. The 10.7-centimeter flux was 66.2, 66.6, 67.9, 68, 68.3, 68.9, and 70.2, with a mean of 68. Estimated planetary A indices were 4, 4, 5, 5, 5, 6, and 6, with a mean of 5. Estimated mid-latitude A indices were 6, 4, 6, 5, 5, 5, and 5, with a mean of 5.1. Send your reports or propagation observations.